Researchers from the University of California, Berkeley, have created a new style of robot that has been inspired by leaping lizards. The teams research indicated that modern-day leaping lizards use their tails to control the orientation of their bodies when leaping through the air, and sparked the new design. The video after the break illustrates how both the lizards and the robot were able to control their body orientation using their tails. Using the lizard video footage, the team of researchers devised a mathematical model to determined how much tail swing would be necessary to compensate for a given amount of angular momentum of the body. 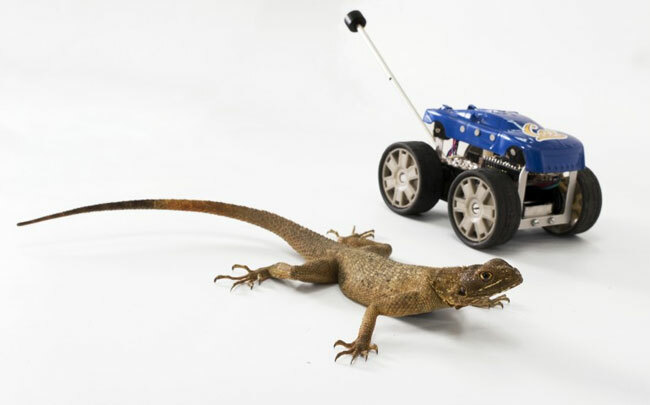 To demonstrate their theory they then created Tailbot, a small radio-controlled car equipped with a motor-controlled tail, and a gyroscopic sensor, to mimic the leaping lizards control. A paper on the UC Berkeley research was recently published in the journal Nature.